We’ve seemed to feature a lot of pitchers on this list. Perhaps that will change as the numbers get smaller. Maybe the hitters tend to be low numbers while pitchers get the big double digit ones. Either that or Josh and I just have a bent for the hurlers, whether they start the game or finish it up. Only Albert Pujols is between the current day and Worrell on the Rookie of the Year winners list for the Cardinals. Worrell burst onto the scene, putting up 30 save seasons in each of his first three full years. Of course, there was one postseason save that he couldn’t lock down (as seen above), but to be fair he had a bit of assistance in that regard. 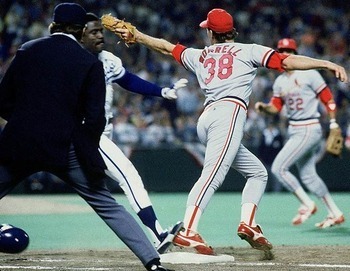 He wound up missing two full years of his time in St. Louis with injury, first elbow and then shoulder, and lost his closer role to Lee Smith in the process. Worrell had another year in St. Louis before heading out to Los Angeles to complete his career with the Dodgers. While he had some success out in LA, his best years were under the Arch. The Cards have had a number of strong closers in their career and Worrell fits right in that line. Todd’s still around the St. Louis area (or was, according to Wikipedia) and it’s a little surprising he’s not had a bigger role with the club, either in the spring or throughout the season. Perhaps we’ll see him around Jupiter sometime over the next few weeks. Most people wouldn’t mind if he had a little chat with Trevor Rosenthal about the ninth inning!